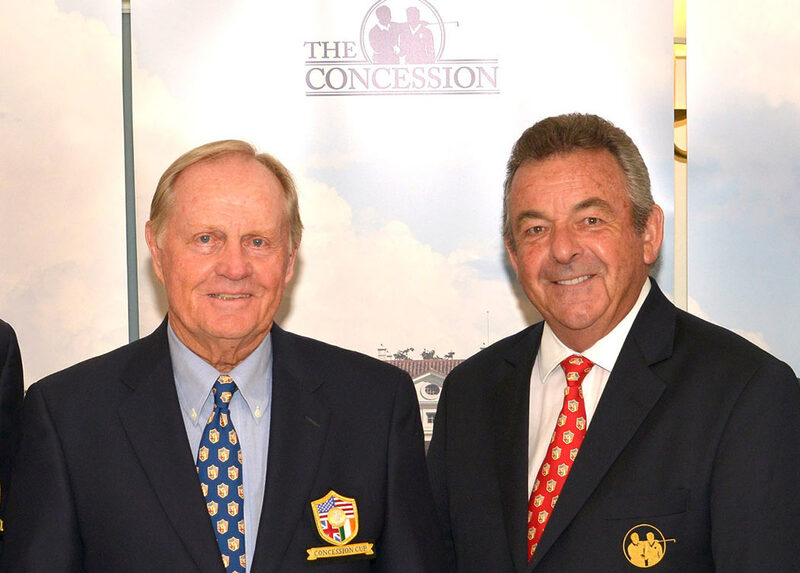 The Amateur Golf Alliance (AGA) and Concession Cup proudly announced today that record-holding 18-time major champion Jack Nicklaus and Tony Jacklin, the most successful and celebrated British player of his generation, will reprise their roles and serve as honorary captains for the second installment of the biennial amateur team match-play competition. The 2016 Concession Cup is April 19–23 at The Concession Golf Club in Bradenton, Florida, the award-winning course and club that was inspired by one of sports’ most-heralded acts of sportsmanship. Known throughout history as “The Concession,” it was at the 1969 Ryder Cup when Nicklaus conceded a 2-foot putt to Jacklin in the final singles match that led to the first tie in the history of the matches. The Concession Cup was created to celebrate this iconic moment. The Concession Cup was created to celebrate amateur golf through the staging of a goodwill match-play competition. The event was also created to provide financial benefit to various worthy charities within the Bradenton/Tampa/St. Petersburg area. The inaugural event in 2014 generated over $176,000 for three very deserving organizations: Orphan’s Heart Foundation, The First Tee of Tampa Bay, The First Tee of Sarasota / Manatee and Nicklaus Children’s Health Care Foundation. Players will compete over three days through the traditional team match-play formats of foursome, fourball and singles. Each team will be comprised of 18 players separated into three categories: eight Mid-Amateur members (age 25 to 54); eight Senior Amateur members, age 55 and older; and two Senior Amateur members, age 65 and older. The U.S. Team won the inaugural Concession Cup title in 2014, capturing the Sir Michael Bonallack and William Campbell Trophy 21½ to 14½ over the GB&I Team. The evening of Tuesday, April 19th, will be a special night for all in attendance. The Opening Celebration will feature a number of special guests from the world of golf. In addition, team members from both the U.S. and GB&I will be recognized through a team presentation. The evening will be available for sponsors and supporters to attend, and perhaps most important will benefit worthy charities. The Concession Cup Am/Am will provide an opportunity for sponsor representatives and individual supporters to play the tournament course with the competitors from both the U.S. and GB&I teams. The first day of the competition will feature nine foursome matches. Four matches will feature teams consisting of two Mid Amateurs, four matches will feature teams consisting of two Senior Amateurs (55+), and one match will feature teams consisting of two Senior Amateurs (65+). The second day of competition will feature nine fourball matches on Friday morning. Eight matches will feature teams consisting of one Mid Amateur paired with one Senior Amateur (55+). One match will feature teams consisting of two Senior Amateurs (65+). The third and final day of competition will feature 18 singles matches. The singles competition comprises one player from each team in match play competition. Immediately following play the closing ceremonies will be held at The Concession Golf Club. For questions concerning sponsorship opportunities and general tournament information, please call 614-764-GOLF or visit www.concessioncup.com.